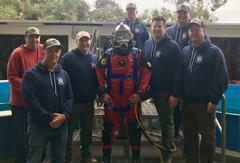 The Santa Barbara County Sheriff’s Underwater Search & Recovery Team (Dive Team) has important new safety equipment thanks to a generous donation from a local philanthropic organization, the Raintree Foundation. The Dive Team trained with the new equipment today, February 27, 2019, at Santa Barbara City College. Due to the Santa Barbara County Sheriff’s Benevolent Posse’s outreach efforts, the Raintree Foundation awarded a $15,000 grant to the Sheriff’s Office. The grant was used to purchase a diving helmet and dive suits that keep deputies safe as they navigate often treacherous underwater environments. These environments often include hazardous materials such as decaying debris, pesticides, or sewage that are capable of spreading disease or infection if diving with recreational diving equipment. The biggest purchase from the grant is a Kirby Morgan 97 helmet with an enclosed breathing apparatus and communications capabilities. This helmet and the dry suits eliminate many of the potential underwater hazards that divers face. The Sheriff’s Benevolent Posse’s mission is to supplement equipment and training for Santa Barbara County’s primary law enforcement personnel in their efforts to safeguard the community. The Posse helps fill the gap between the County’s increasing public safety needs for law enforcement and the tightening county budget.